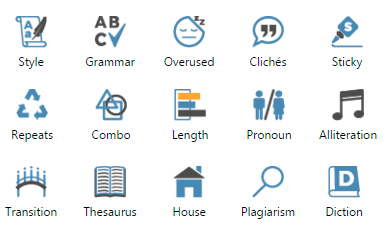 ProWritingAid provides more features than any other manuscript editing software on the market, including many that are unique to our product. We want to help you make your writing the best it can be. ProWritingAid analyzes your writing and presents its findings in over 20 different reports (more than any other editing software). Each writer has their own strengths and weaknesses and so different reports will appeal to different users. Most editing software supports Windows only. We support both Mac and Windows users through our desktop app. Your premium license covers Mac and Windows and all of our word-processor integrations. Most editing software forces you to copy and paste between your word processor and a website. In the process, you lose your formatting, valuable time, and possibly your patience. We are the only software that integrates with MS Word, Open Office, Google Docs, Scrivener and Google Chrome so you can edit wherever you write. 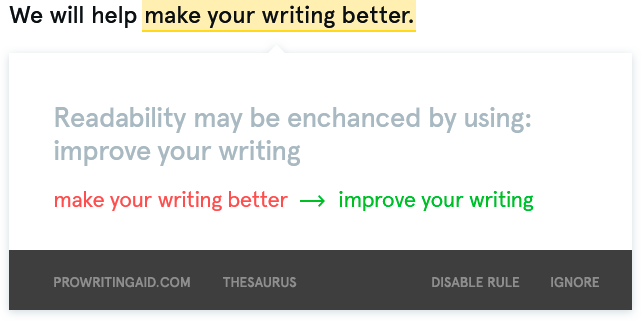 This report highlights every word that can be changed for a synonym, allowing you to quickly explore different wordings. We only suggest words that fit the context and order them so that the best suggestions come first. 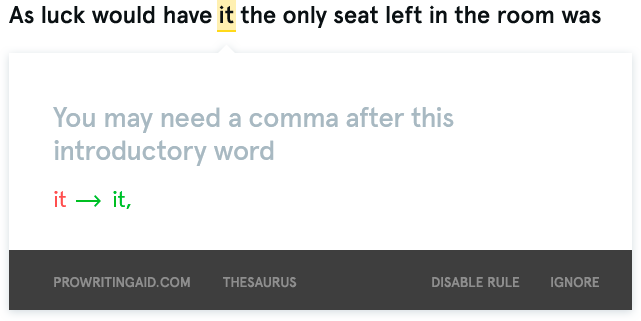 Our Word Explorer is the ultimate tool for finding the right words and breaking through writers' block. 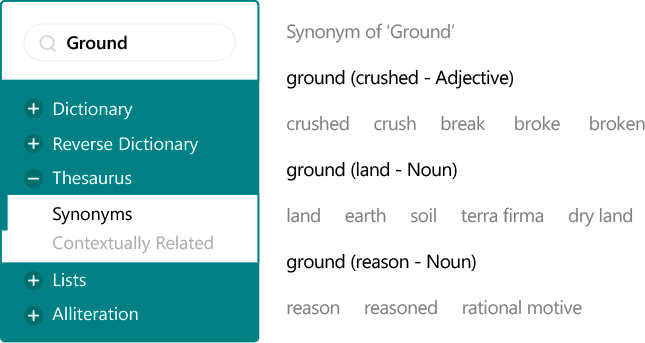 It contains a thesaurus, contextually related words, dictionary, reverse dictionary, collocation dictionary, alliteration dictionary, cliche dictionary, rhymes and example usages from poetry, prose and songs. 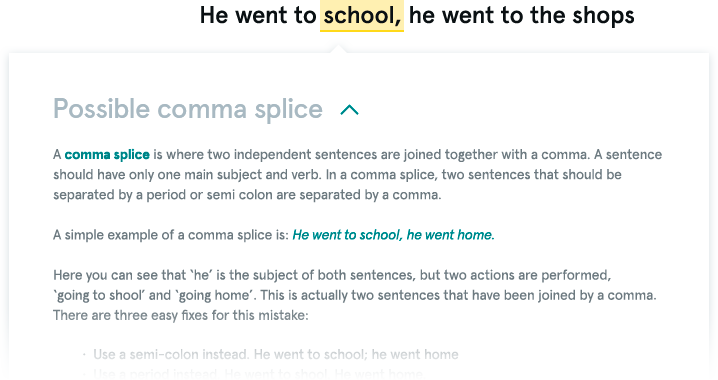 We're the only manuscript editing software that includes contextual spelling, grammar and punctuation checking. You effectively get two products for the price of one. We include a detailed explanation, where appropriate, so that you don't have to go searching around the web for more information. It's difficult for writers to spot repetition in their own work. And when you replace a word when making amendments, it's easy to forget that the same word was in the sentence before or after. 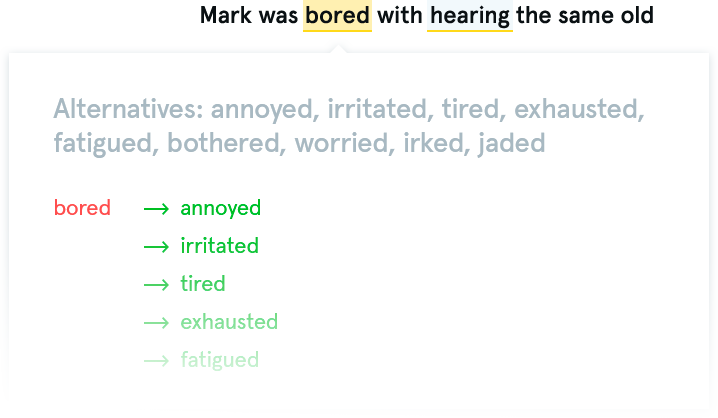 We highlight repeated words and phrases in your document so you can use a more diverse vocabulary. Our team of copy editors has hand-coded thousands of rules to cover the most vital style improvements you can make.